I haven't shown you guys my poster yet. I can't believe it! I am in LOVE with this thing! I'm trying to figure out a place to hang it in my office. This is what the boys met me at the airport with. I was so overwhelmed with happiness to see them and the poster was just icing on the already amazing cake! Ok, next is just a super simple card I made. Isn't that CRAZY? I actually made a card. It's like I have some sort of craft blog or something. ;) This card was so fast but I LOVE it! It's just some MME Be*Loved paper, some sheer organza ribbon from Michael's, and an Ippity stamp from the Straight From the Heart set. (This set is perfect for Valentine's Day and is available for purchase in my right sidebar >>>>) This is my take on the inspiration challenge on Melissa Phillips blog, you can see her challenge HERE. Awww, I love your poster! How sweet is that?! I LOVE your card too! Very elegant! 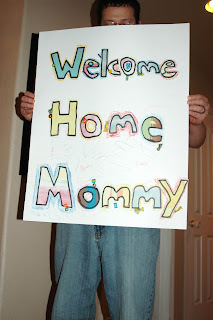 Oh my gosh Ashley, this poster is is so precious, and your hubby and boys are too! I keep everything handmade by my son still. Your card is sooo cute...love it! How sweet is that!!!! Awwwwwww and your card is PERRRRTY! awwwwwww ashley! what a fabulous poster. such love! and a stunning card. Your card is fabulous but that poster is too cute for words!! This is just adorably sweet....love the simplicity and the way it's all wrapped up with ribbon hugging it....wonderful! I come to your blog every single week and could have sworn I have left you comments! But I look back now and I don't see any of my comments...But I remember every single one of your cards...Hmmm...did you delete them all? Hahaha...miss you too girlie! Come to Chicago! 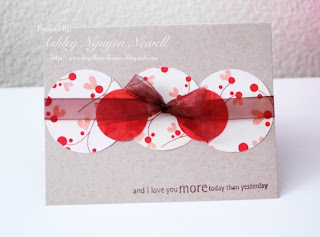 This is gorgeous Ash - I'm loving your card!